Producers of processed lithium - an essential element for batteries used in electric cars - are agreeing to long-term contracts with their customers to fund the investments needed to address a looming shortfall. Demand for battery-grade lithium compounds is expected to skyrocket in the next decades in tandem with soaring demand for electric cars as governments and individual consumers try to reduce their carbon footprint. Although there's plenty of lithium around, the problem is ensuring there is enough capacity to process it. 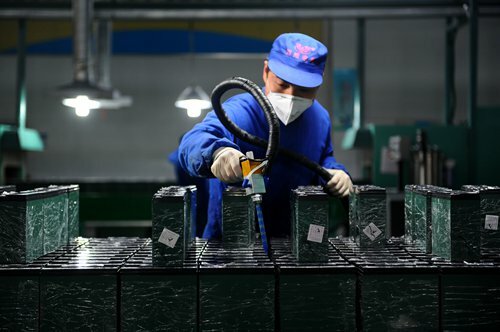 Battery makers and other end-users such as car manufacturers will need to sign multi-year deals that encourage large producers to invest more, and faster, industry sources say. "We've established the timeline for our own expansion based on the commitments our customers are making with us," said Tom Schneberger, global business director at US-listed FMC Lithium, one of the world's top four producers. "Our first priority will be to provide the adequate supply of the high quality products upon which [our strategic customers] rely," he said. Expansion plans by Chile's Sociedad Quimica Y Minera (SQM), another of the top four, for next year are also based on long-term agreements, the company told Reuters. The production and use of electric cars is projected by Morgan Stanley analysts to rise to 2.9 percent of 99 million new vehicles in 2020 and to 9.4 percent of 102 million new vehicles in 2025, from 1.1 percent of 86.5 million this year. By 2050, 81 percent of 132 million new auto sales will be electric, Morgan Stanley says. The lithium-ion batteries needed to power electric cars use lithium carbonate or lithium hydroxide, but the industry typically talks in terms of lithium carbonate equivalent which contains both. Two types of lithium deposits dominate. One is hard rock as found in Australia, for which ready-to-go capacity to produce battery-grade lithium can take up to three years. The other is brine, mostly found in Chile and Argentina, which can take seven years or more. China has reserves of both. UK-based consultancy Roskill estimate 785,000 tons of lithium carbonate equivalent a year will be needed by 2025, amounting to a 26,000-ton shortfall from anticipated supply, compared to 217,000 tons of demand versus 227,000 tons of supply this year. Others expect an even larger deficit. "There's limited visibility into where we're going to get the last 200,000 tons of lithium if we hit the numbers Roskill is expecting for 2025," said Seth Ginns, a managing director at New York-based equity manager Jennison Associates. Jennison manages more than $164 billion of investment and is a top 10 investor in both FMC and US-listed Albemarle, another of the top four producers. "We estimate the lithium industry is going to need between $4 billion and $5 billion of investment out to 2025," said Simon Moores, managing director at London-based consultancy Benchmark Mineral Intelligence. Price projections out to 2025 are not available, but Benchmark estimates prices of lithium carbonate will average $13,000 a ton over the 2017-20 period from around $9,000 a ton in 2015-16. Demand for lithium hydroxide, preferred over carbonate as it allows greater battery capacity and longer life, is expected to grow at a faster pace. Benchmark predicts the price to average $18,000 a ton in 2017-20 against $14,000 in 2015-16. Top producers are looking at a bonanza if they can ramp up investment fast enough with end-user commitments in hand. "There are four names that dominate and that is likely to be the case for the next five years," said Jeremy Kent, a portfolio manager at Allianz Global Investors. Roskill managing director Robert Baylis estimates FMC, Albemarle, SQM and China's Tianqi Lithium Corporation together accounted for 66 percent of the world's lithium carbonate equivalent last year. Wood Mackenzie consultant James Whiteside puts the figure at 78 percent. FMC's lithium hydroxide capacity rose 80 percent in 2017 to 18,000 tons a year, and it has plans to boost that to 30,000 tons by the end of 2019. After that, capacity will be expanded as required by demand, FMC's Schneberger said. Albemarle is planning to expand its lithium carbonate equivalent capacity to 165,000 tons by 2021 from 89,000 tons this year, a spokesperson said. "We anticipate spending $700 million and $1 billion over the next five years." SQM said in an e-mail it was planning to invest $50 million to expand its lithium carbonate capacity in Chile to 63,000 tons by 2018 from 48,000 tons currently. It also has joint ventures in Argentina and Australia to develop deposits. Tianqi Lithium declined to comment on its investment plans. Another company actively investing is Australia's Orocobre, which planned to produce 17,500 tons a year of lithium carbonate at its Olaroz facility in Argentina. Severe weather cut this year's production to 11,800 tons, however. Whiteside said Orocobre's difficulties were typical of many smaller players, noting that the Olaroz facility was the first new major brine operation started in 20 years. "Because the number of brine operations has been so few historically, there are very few technically experienced chemical engineers to assist these junior companies," he said. "There are people out there promoting brine projects with plans that are not as robust as they should be."